The golf course closed at the conclusion of yesterday's play, this is the 11th time in my career I’ve had the pleasure of calling time on a golf season. While it is a day Minnesota golfer’s dread, it is one that never ceases to fill a golf course maintenance team with satisfaction. Not because it’s over, but because of the sense of accomplishment created. We’ve done it! The early mornings, the long days, the tournaments, and the weekends-they’ve all come, they’ve all been conquered and it’s a wonderful feeling. This year, for the first time, the Green Committee decided the golf course would close on October 31st, regardless of weather conditions. While this date seems sensible today, just two weeks ago it seemed there would be more good weather and further opportunity to play the course. With that in mind, I wanted to provide the three reasons a hard close was decided upon. Preparing this golf course for winter requires a number of procedures not enjoyed by golfers. Topdressing, DryJect and deep-tine aerification, spraying of winter protection chemicals, and winterization of the irrigation system all must be completed before freezing weather sets in. In previous years, without a hard close, these procedures began while the course was still open. The need for this work created an undesirable juxtaposition with the high expectations of our members and guests. By implementing a hard close, we’ve been able to move all winter preparations after the close and thus our members will no longer be subject to the manner in which these procedures decrease the presentation of the golf course. From roughly the middle of October, the turf no longer grows at a rate allowing for recovery from wear and tear associated with regular play. Closing on October 31st limits this wear and tear and will result in better conditions when the course opens in the spring. Additionally, voids from wear and tear in the late fall and early spring have the potential to create opportunity for Poa annua infiltration; owing to the fact Poa grows later into the fall and begins its growth earlier in the spring than bentgrass. The target of a closing date allows for greater accuracy of scheduling, and thus better service in all areas of the Club. In the turfgrass department, most of our seasonal staff will continue to work until Thanksgiving, and with the course closed, our focus can shift to projects around the golf course. 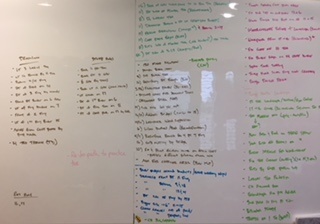 We have a whiteboard in our office full of projects and ideas for the fall. Not all will be completed, but with them as our sole focus, we’ll make strong progress. Even as we prepared for last year’s Ryder Cup, I was looking forward to 2017 and the challenges a post-Ryder Cup season would present. The curse of the golf course superintendent is we strive every year to better ourselves and the course with which we are trusted. In making the course better, we then establish the new standard by which we will be judged. If we aren’t careful, we can easily become a victim of our success. The success of 2016 Ryder Cup, and the manner in which this team presented the course for the event, created a new standard and insured 2017 would be one of my most challenging seasons as a golf course superintendent. As I write on the final day of the 2017, I can say with conviction and a great deal of satisfaction; this team has met and exceeded the challenge of the 2017 golf season. This team is a collection of leaders, mentors, friends, teammates and incredibly smart hard-working people. As a Hazeltine member, I hope you are as proud of your golf course as we are at having been able to produce it.